Where’s the Money, Lebowski? That’s a loaded question, dude, and one of many you’ll answer in this hilarious game of personal questions inspired by The Big Lebowski. Whether you have seen the cult classic film 0, 1 or 100 times, your enjoyment level and chance of winning are not an issue. It’s just a game, man. This game is great for an older audience with at least 4 players. Played similar to other "favorite answer" type games, this game has a few differences and twists that make it fun. Join in the fun and give Where’s the Money, Lebowski a try today. The player with the most amount of money after three full rounds wins the game. Inside the box are 10 question cards, 55 money cards, 21 abide cards, answer pad, 6 pencils and the official Where’s the Money, Lebowski game rules and instructions. 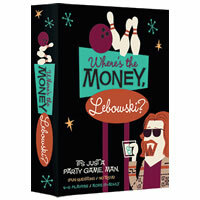 Please keep in mind that the official Where’s the Money, Lebowski party rules and instructions could be different depending on the game version you have. The rules below are some of the exact directions on how to play Where’s the Money, Lebowski. Share with us your comments, funny stories, tips, advice, strategies, creative ways to play, questions about how to play, problems with the rules or anything you want about Where’s the Money, Lebowski. All submissions will be reviewed within 24 hours. Click here to add your Where’s the Money, Lebowski comments.